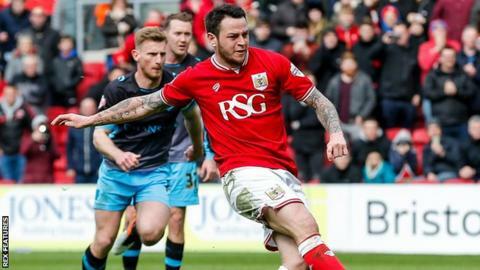 Bristol City head coach Lee Johnson has praised on-loan midfielder Lee Tomlin following the Robins' 4-1 win over play-off chasing Sheffield Wednesday. Tomlin, 27, scored twice to take his tally to five goals in 13 games since signing from Bournemouth in January. "Bristol City fans love a maverick, don't they?" Johnson said. "Sometimes he looks like a pub player in his frame, but as soon as he gets the ball at his feet he turns into a top-class footballer." The result lifted Bristol City to 18th in the Championship, 10 points clear of the relegation zone with five games to play. "It's been a big win as far as maintaining our status," Johnson told BBC Radio Bristol. "Not just the win, but the goal difference swing with our friend [Rotherham manager] Neil Warnock having a fantastic win at MK Dons - well done, Neil. "It's important that we just keep going. We're going to need another win at least, and we've always said we want to set the tone not just for now but for next season as well."